This journey necessitates a critical journey into the ancient Greek world, Jewish Hellenism, Paul, and references from the New Testament to find answers. The Greek-Jewish faith is one of the biggest background stories to the New Testament writings and the fledgling Jewish Messianic movement—one that was later to entirely break off from its parent and be called Christianity. If it were not for the dominant presence of the Greek language and culture in the Jesus narrative, the story of salvation would never have become an international phenomenon. The resurrection was timed perfectly for an explosive expansion for all humanity to hear. Greek Judaism has a different story than the Aramaic one. One of the biggest differences is that the Aramaic Jews developed a wealth of literature for posterity, while the Greek Jews have left very little. This lack of literature does not negate the influence of Greek culture and language on Jewish life because of an obvious overarching fact. The impact of the Greek language and culture on first-century Judaism and everyone else within the Meditteranean, North Africa, and the Middle-East regions is so great that it is incalculable. It is no coincidence that the New Testament was written in Greek rather than Hebrew or Aramaic. No other language or culture, except perhaps English or Latin, has had so great a universal impact. It is traditionally held that the Roman Empire around the first century was approximately 50 million.2 His calculation does roughly fit within this formula. How Harnack acquired these statistics is not known. He concluded this over a century ago. New statistics are not available that either prove or disprove his results. I have to rest on his high reputation alone. These statistics are subject to change if improved and substantiated information comes forward. These findings do not include the Jewish population in the then Parthian empire which included Babylon. Harnack outlined a framework where Jews living in Greek-dominated lands were far larger than those that lived in the Roman-ruled Middle-East. As a researcher, this statistic was startling, especially in light of the lack of Jewish-Greek literature available for this period. One would think with such a great mass of Jewish-Greeks living at that time there would be a broad representation of Jewish-Greek literature. Outside the publications representing the New Testament, Septuagint, Philo, and Josephus, this is not the case. However, this falls into the category of the rare existence of any first-century literature. This problem applies to Jewish-Aramaic literature too. The production of Aramaic literature comes at a later time. The New Testament letters make a distinction between the two, but it is not an adversative relationship. There was no Greek Jewish institution separate from the Temple in Jerusalem. Nor was there any Jewish-Greek nationalist movement or hierarchical leadership structure. The small reference to the Hellenizers portray a group striving to maintain the Hebrew faith while living in a Greek world. The narrative of Pentecost in the Book of Acts did not recognize Jewish Hellenists as an institution or separate movement either. The geographic outlay of the Pentecost outburst did not rest on the Greek language or the boundaries of the Roman Empire. Rather, it outlined all the Jewish communities that existed from the Parthian Empire (starting from the western boundaries of Afghanistan, Turkmenistan, and Pakistan) to the westerly reaches of the Mediterranean basin. The focus was on native languages and not Greek. The narrative suggests that Greek was not the mother-tongue of these peoples throughout the Greek diaspora, but rather connected by Greek as the universal common tongue. Even Parthia, one of the greatest rivals to Rome, had recognized Greek as one of their official tongues. Greek was the glue that held everyone together throughout the Jewish world. This language primacy is similar to what the English language holds in the world today. The narrative of Pentecost showed that Jews of all the nations flocked to Jerusalem, and especially looked upon the Temple as the source of authority. They recognized Jerusalem as the center of the Jewish faith. As is documented throughout this series, the Hebrew language was a source of unity. The Hebrew culture and liturgy were not antithetical to the Jewish Greek identity. The Greeks believed their language and culture to be superior to anything else. For example the last non-Christian Roman Emperor, Julian, rejected what was then known to be the sect of the Galileans (Christianity) because it was not of Greek origin, nor wrought from the Greek language, and worse yet, it came from something obscure and unimportant as Hebrew. Julian was an Emperor of the Roman empire for two short years (361–363 AD). During this period, Rome was in a divided and crumbling state. In order to restore Rome to its former glory, he felt it necessary to undermine the Christian religion and reinstate the ancient Roman customs. His anti-Christian polemical writings, although not available today in original form, were very popular and widespread. This popularity went beyond his grave. Later Christian leaders such as Cyril of Alexandria (378–444 AD), were compelled to write a defense against his volleys. Because of Cyril’s treatise against Julian, we find excerpts of Julian’s original message, and are able to somewhat piece together Julian’s original thoughts. If one applies the superiority of Greek over Hebrew into the Corinthian saga, then it would be a conflict over the abandonment of Hebrew for only Greek. I don’t think this was the case here. Hellenistic Jews still had a great attachment to Jerusalem and its customs during this time. Jerusalem had yet to start the insurrection or suffer its crushing defeat. The loss of Hebrew would have been too much a religious shift for Paul or the original Jews of Corinth to make. Even though there is more to come about linguistic infighting, it already comes as no surprise that Paul, an Antiochan Jew, who likely spoke Attic, along with Hebrew and Aramaic, encountered problems navigating through the Corinthian ethos whose native tongue was Doric. Now it is time to delve further about the conflict between Doric, Aeolic, and Attic Greeks. Epiphanius’ explanation needs a detailed look into these three Greek dialects. The following results are a detour from the usual approach in the Gift of Tongues Project which stresses use of source texts. The familiarity of Greek literature before the first-century AD is outside the expertise of the author and therefore reliant on third-party analysis. This map represents the language groups around 200 BC. There is no map that could be found for the first century. According to Epiphanius, this was still a close representation for the first century. As was stated in the introduction, Corinth was not an old city, but a new one reestablished and colonized by Rome. It attracted a wide spectrum of peoples and languages. Corinth was almost in the epicentre where these three language groups bordered. There were two types of Attic – the native Attic spoken by Athenians, and those that spoke a derivative of Attic throughout the Macedonian Empire broadly labelled by moderns as Koine. Attic was designated the language of the Greek empire by Philip II, father of Alexander the Great.14 It evolved as an official language for over three hundred years before the Christian era, separate from that of the Athenian experience, and became the primary, and if not, an important secondary language for the inhabitants of conquered lands. This internationalized Attic is commonly referred to today as Koine Greek. The international version became its own brand, surpassing that of its parent by a significant magnitude. Athens was slightly east of Corinth. Epiphanius was likely referring to the Attic spoken by the Athenians, not the massively influential Koine child. 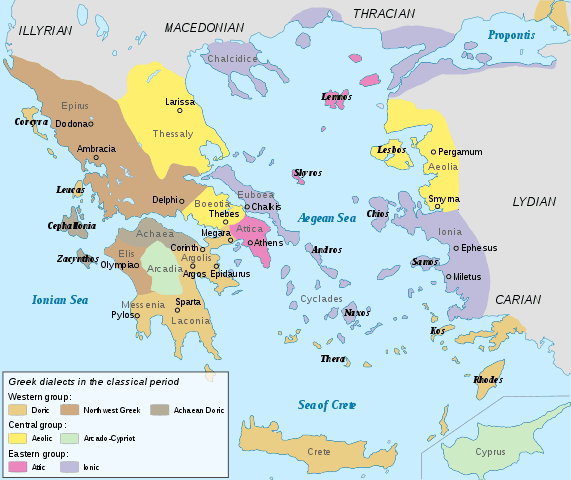 Koine became the literary standard throughout the Greek Empire, but it did not sideline the various Greek spoken dialects throughout Greece major and immediately east of it on the Asiatic coast in the first century. A very small number of people in Greece still speak a Doric dialect called Tsakonian. Here is an interesting link to a YouTube video on the differences between Tsakonian and Attic. The Last Spartans: the Survival of Laconic Greek. Aeolic slightly to the north was utilized by the city of Thebes and surrounding areas. An older historian from the 1800s, Ernst Curtis, believed the Aeolic tongue as not a dialect, but the mother of all the Greek languages.17 It is unclear whether the Aeolic Greeks felt this same idea of primacy, but it was a Greek dialect nonetheless representing a major ethnic group in Greece. One major Greek language group was missing in Epiphanius’ account, Ionic. This dialect had merged with Attic by the first century and lost its own independent use. Epiphanius could have simply been too general, ignorant of language histories, or simply biased against Ionic when he wrote this. We will assume this is not the case in order to finish answering Epiphanius’ assertion. Paul was dealing with a multicultural problem regarding not only the acceptance of Hebrew as the principal language of instruction but was stepping into a political minefield regarding which Greek language would be the standard one for the liturgy. The background evidence on the Greek life and culture supplied supports Epiphanius’ assertion that the Corinthian tongues conflict was between Doric, Aeolic and Attic Greeks. It makes reasonable sense that can be supported by history. It also demonstrates the impact of the Greek language and culture was everywhere in Paul’s time and it cannot be omitted while reading his first letter to the Corinthians. S. Cyrilli Alexandrini, Contra Julianum, Lib. VII . MPG: Vol. 76. Pg. 858. Translation is mine. Very informative and well written, Charles! Wish I could have had access to this back in my seminary days.